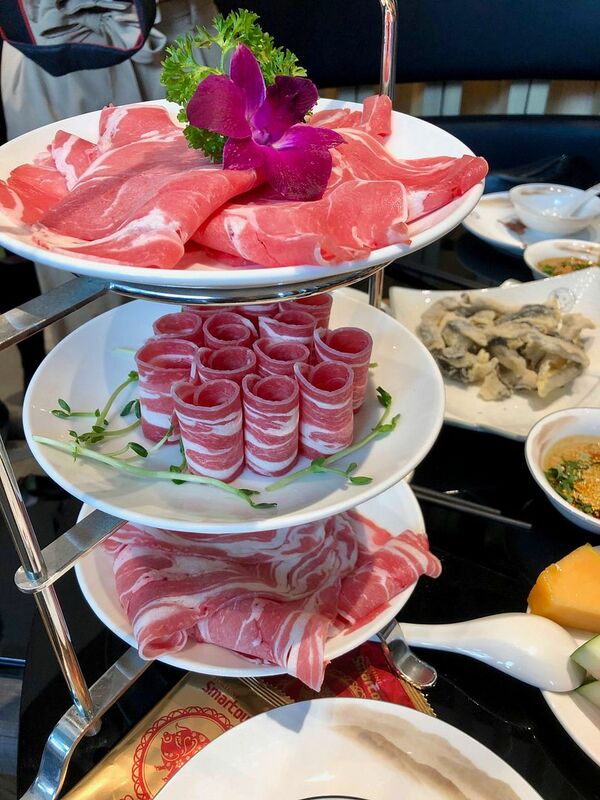 For those who travel the world in search of great hotpot experiences, the name Little Sheep (小肥羊, or literally Little Fat Sheep) needs no further introduction with their outlets in Canada, China, Japan and the US. 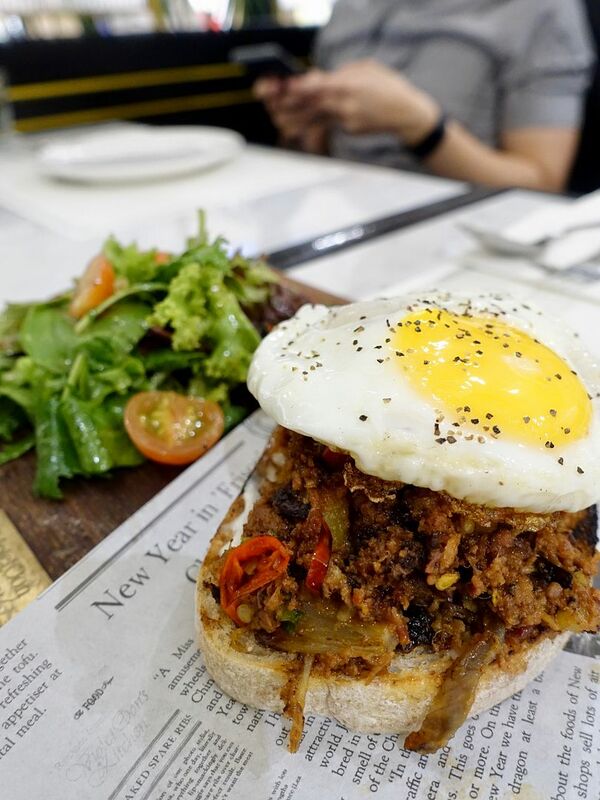 For the rest of us who prefer local food adventures, we’ll be glad to know that they’ve finally come to Singapore, with their first outlet located at One Fullerton. 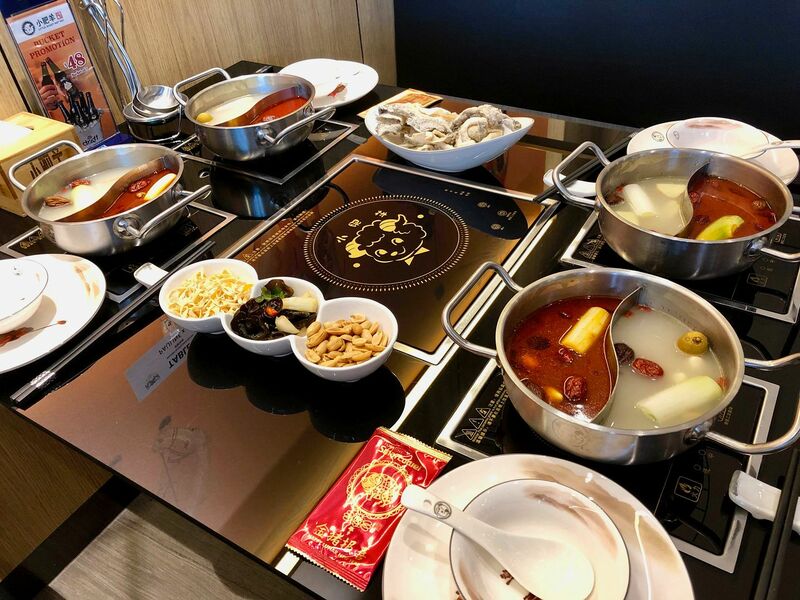 Given the glut of hotpot places opening in Singapore lately, our first impression was that Little Sheep needed to really bring their A game if they wanted to stand out from the crowd. After our first visit to their latest outlet, we were certain that Little Sheep is more than ready to take on the competition. 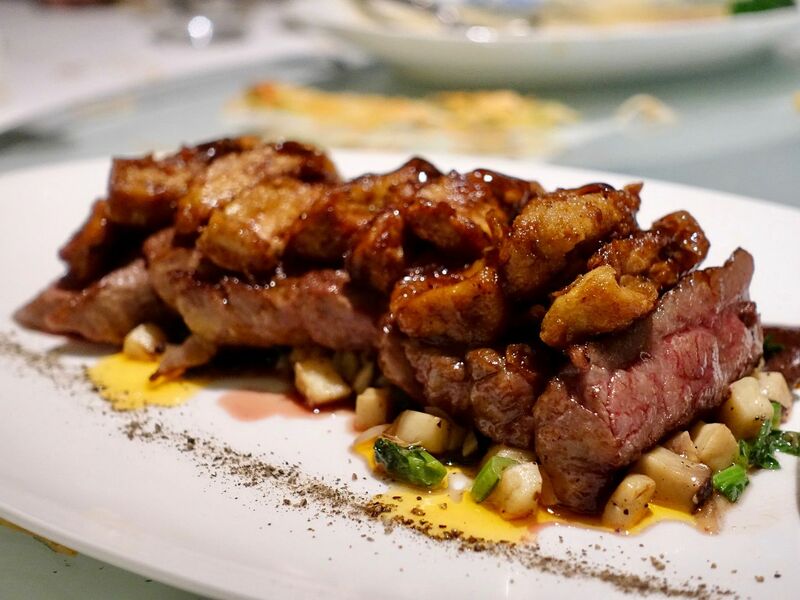 Established in 1999 and originating from Inner Mongolia, Little Sheep’s offering focuses squarely on the quality of their broths and the freshness of their ingredients. Their signature broths include House Original White Soup ($9 for small / $20 for large) as well as a fierier House Spicy Mala Soup ($9 for small / $20 for large). I was particularly impressed by Little Sheep’s Mala Soup, since it came with plenty of flavour without being too intense. Little Sheep has a range of sauces similar to most other hotpot joints, along with some unique touches for those of us with more adventurous tastebuds (think lime juice, or fermented beancurd) to explore. However, the fact that all labels are in Chinese also means that patrons who don’t read the language will face more challenges here – a key area of improvement for sure. Having said that, our servers were also more than happy to mix their house blends for us, even going as far as serving a special one meant for pairing with their fresh seafood. 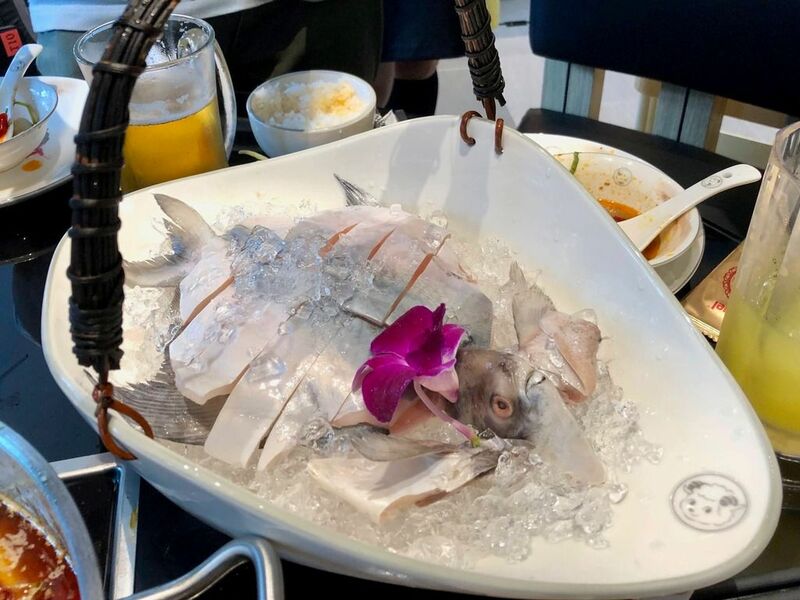 Most hotpot places serve reasonably fresh seafood, but the White Pomfret ($22) served on ice gets top marks for presentation as well as quality. 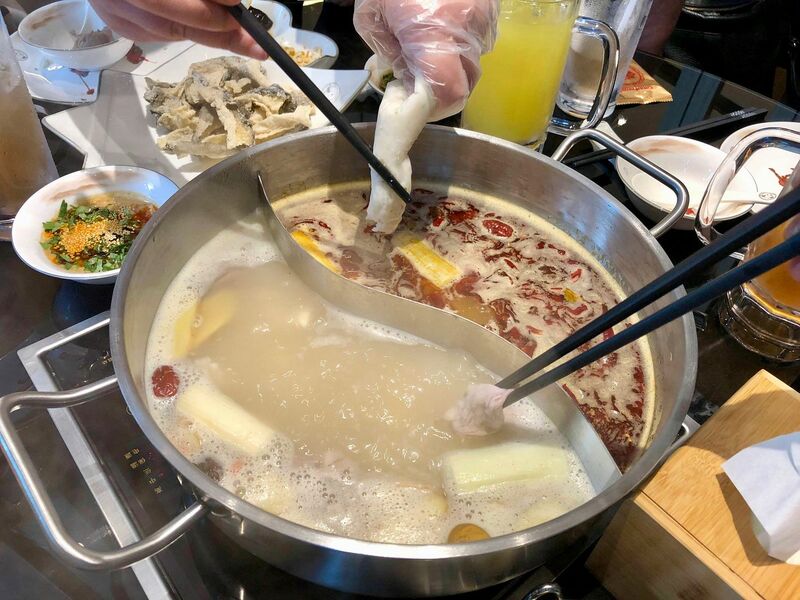 When we were done, our servers added the bones to the soup – although it's fairly common for fish head steamboat, it's less common to do that for hotpot (and for good reason – it takes up real estate in the pot and doesn’t add much to the dining experience). Our recommendation? Skip adding the bones entirely – the soup doesn’t need the boost! Little Sheep’s main claim to fame (as the name suggests) is lamb, best represented by their 3-Tier Signature Lamb Platter ($36). The lamb is fresh and sliced thinly enough to cook within seconds in the pot, and was an absolute delight, even for those who don’t usually enjoy lamb. We also didn’t detect any of the gaminess or strong flavor typically associated with lamb, which made the meat even more enjoyable. However, the real showstopper was clearly the Signature Lamb Kebab ($8). 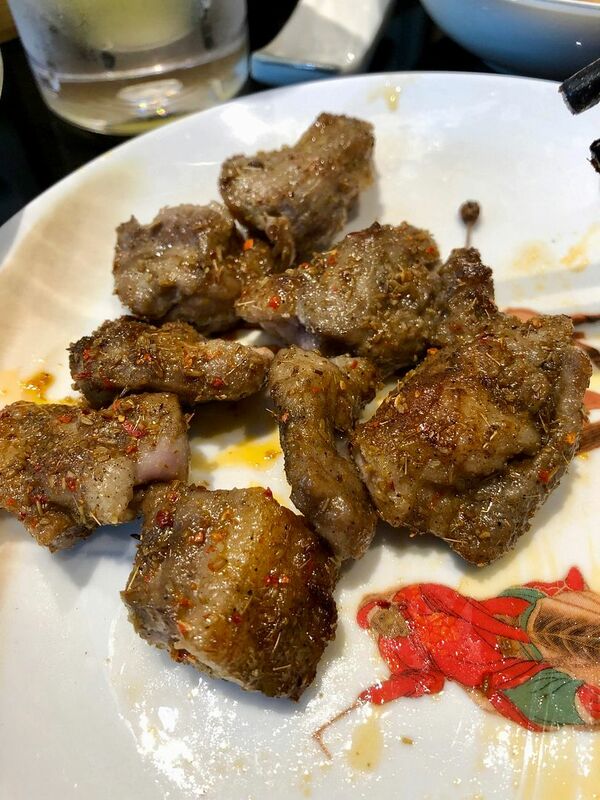 Heartily seasoned and served fresh from the grill, sliding the chunks of juicy lamb off large metal skewers made for a really fun dining experience, not to mention tasty. For a more adventurous experience closer to Little Sheep’s Mongolian origins, put manners aside and consider eating your lamb right off the skewers! No hotpot experience is complete without the usual meatballs and assorted dumplings, but Little Sheep once again takes it to the next level with their Handmade Prawn Paste ($9/$18) with bits of fresh prawn providing texture, as well as Juicy Beef Balls ($8) that squirt boiling soup if you’re not careful while biting into them (yes, we’re speaking from experience). 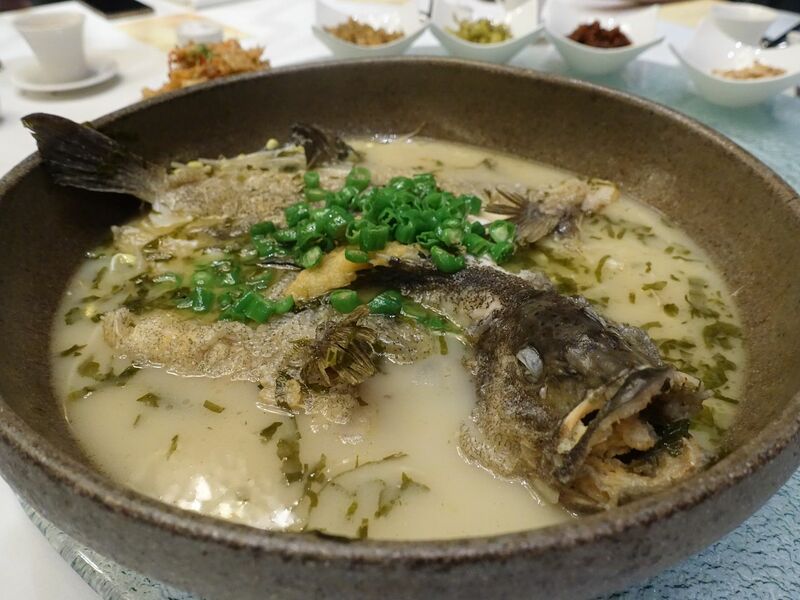 Skip the dumplings unless you're a fan of starchy soup (it disintegrates) and save your stomach space for something a bit more exotic like the Handmade Snakehead Fish Paste ($9/$18), or even the Pork Aorta ($13) and Beef Tripe ($16). 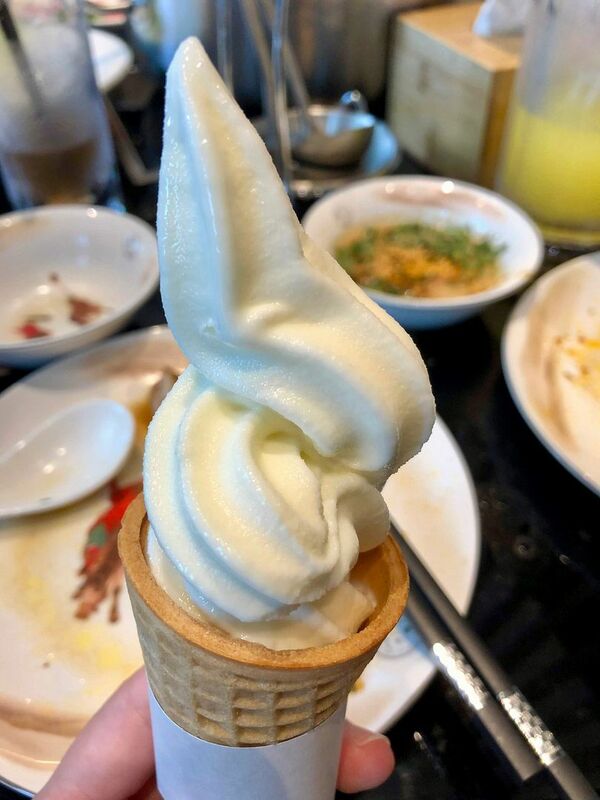 Finish off your meal with some of Little Sheep’s complimentary soft serve (which we liked for not being too sweet), and walk off some of the calories along the Fullerton promenade – a really satisfying way to end off a satisfying hotpot experience. I've tried several Singapore Airlines Business Class products and have been waiting to check out the A350-900 Business Class design since it was rolled out 2 years ago. I originally thought i'd be able to check out the then new design on my SIN-NRT flight but they did not retrofit that particular SQ B777-300ER. I finally managed to do so on our honeymoon by taking the twice weekly non-stop SIN-BCN flight on SQ and then another flight from Barcelona to Casablanca. The honeymoon travel posts will eventually come (2 years later). We all know that the A350 is a new generation aircraft and i thought that the flight experience is a lot more comfortable than the other aircraft- it's quieter and the air feels less drying, so yes, tech works. There are 42 Business Class seats in a 1-2-1 seat layout. As you can tell, the seats are generous in size, though not as huge as the older designs. But hey, even if you're a big dude, the 60" seat pitch and 28" seat width beats many other airlines offering out there. The Scottish leather seat can be adjusted to your comfort with the numerous buttons to play with. There are two new seating positions—the Lazy Z, a cradling position that ensures your weight is centered and balanced when you’re sitting down, and the Sundeck, a lounging position that extends the base and foot of your seat so you can stretch and rest your legs on the ottoman. The seat also transforms into a 78" flat bed when you're ready to snooze and it comes with a cushioned headboard, complete with linen, duvet and pillows. This is why i love taking SQ business class on long-hauls. The side lights were very useful for reading under different conditions, be it sitting upright, in-bed, or lounging. I don't think Jr was too bothered by my light as it didn't spill that much into his cabin. Also, there are also 2 earphone jacks, for sitting and lying down. I thought that is a very thoughtful design! There was a time when we thought about fine Italian dining, the ilLido name would come up. I mean, that was before the booming food scene (i'm obviously not a young millenial). I remember dining at ilLido was a special affair- I parted with my hard-earned tuition money for a date at ilLido. How times have changed! Anyhow, now you don't have to break the bank and could enjoy the same great Italian fares at Amò, the smart-casual Italian eatery and bar by established restaurateur-chef Beppe De Vito of the ilLido Group. I very much preferred the casual-chic setting of Amò and also the central location at Hong Kong Street. 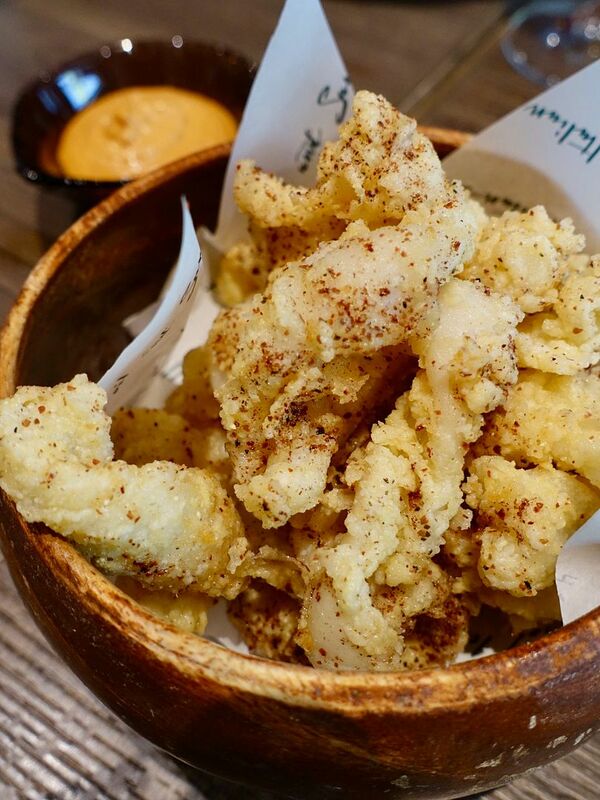 We started our meal with a crispy calamari with sumac and sun-dried tomato aioli ($19). The sauce is what makes the dish, along with the crunchy batter. 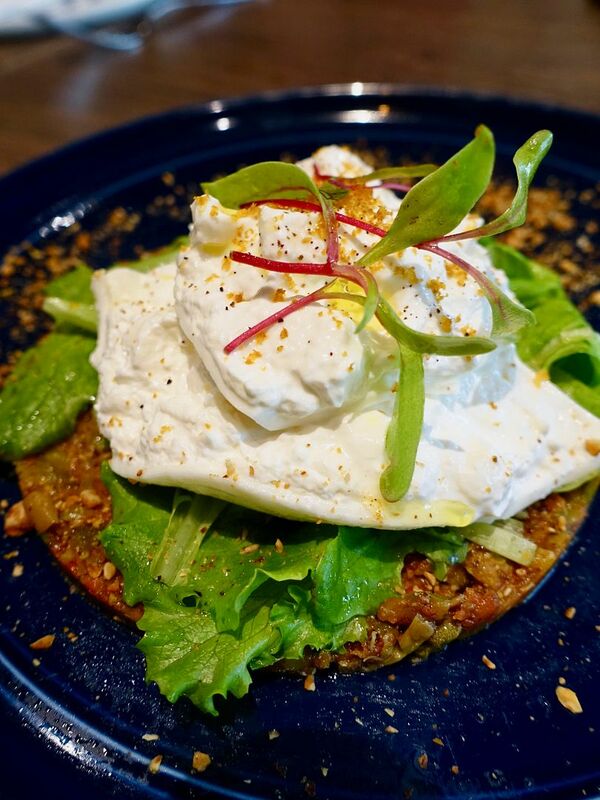 Burrata is always a good idea, and the one here is accompanied by an eggplant salad, walnuts and bottarga ($28). The private dining game in Singapore is going strong. I'm in a chat group with some fellow foodies (many famous ones), for such private dining dates. Mind you, private dining in Singapore is anything but cheap, with prices starting from $70 per head (check out fellow foodie The Ranting Panda's list of some private home dining). Perhaps it's the exclusivity that drives dinner to home restaurants, or the special recipes passed down from the generations before. Well some restaurants are also trying to get on the private dining bandwagon, Subrosa is one of them. The rather new restaurant along Jalan Besar is branded as a private dining restaurant which delivers an exclusive farm-to-table fine dining experience, using local ingredients such as their own locally-grown lobsters and in-house herb garden and all items are made from scratch. I wondered what is the story behind Subrosa. What's special about it that warrants the private dining tag? Well.. i found none. 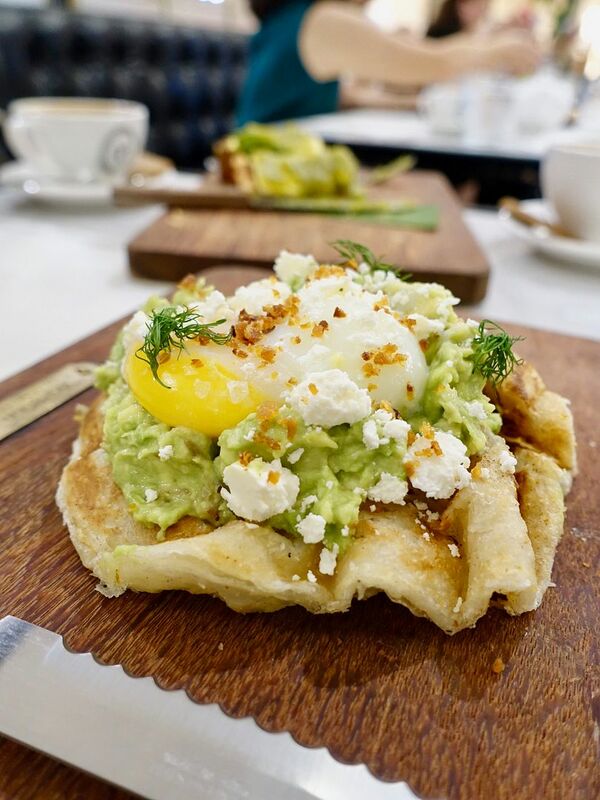 Subrosa is helmed by Executive Chef Steven Snowdon, who cooked for the British Royal Family several times, and worked at several Michelin starred restaurants. 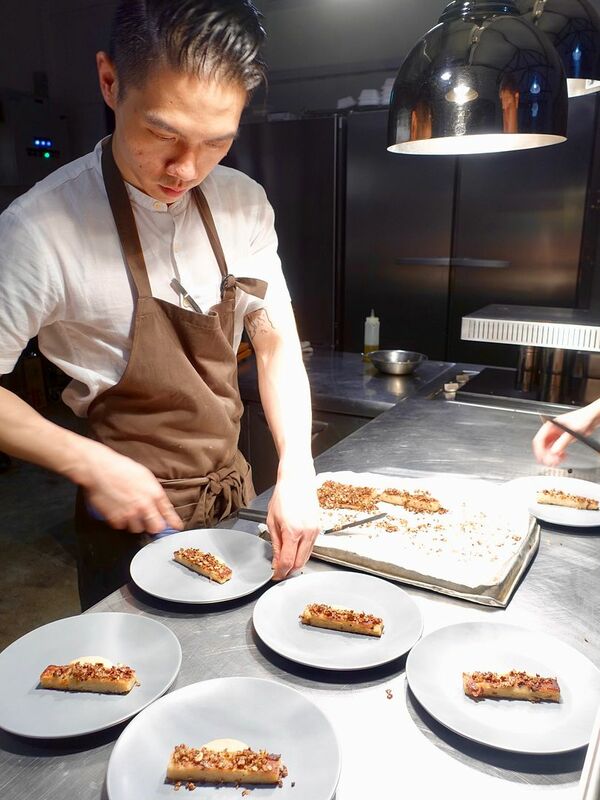 Consulting Chef Francis Lee has more of a private dining cooking experience, being a private chef for some celebrities and Singapore high society members. However, the menu doesn't have a strong focus on heritage, story, or even personality. That's not to say that the food is bad. It's just not remotely private dining. Branding aside, i thought most of the dishes had a Japanese influence, with the exception of some. Our meal started with their homemade breads, which were a mix of fluffiness and chewiness. Their truffle butter also had this amazing earthy quality- it was almost like biting into a mushroom. Then, a buttermilk cured scallop dish served with fermented melon, pickled cucumber, dill oil and caviar. A Siracha and wasabi dressing, together with some lemon gel, provided an Asian twist to this carpaccio. It must have been pretty good for me to forget about the photo. 2019 is Singapore's bicentennial so expect a lot of multi-ethnic, historic promotions coming your way this year. Here's one if you would like a taste of all our signature hawker food. 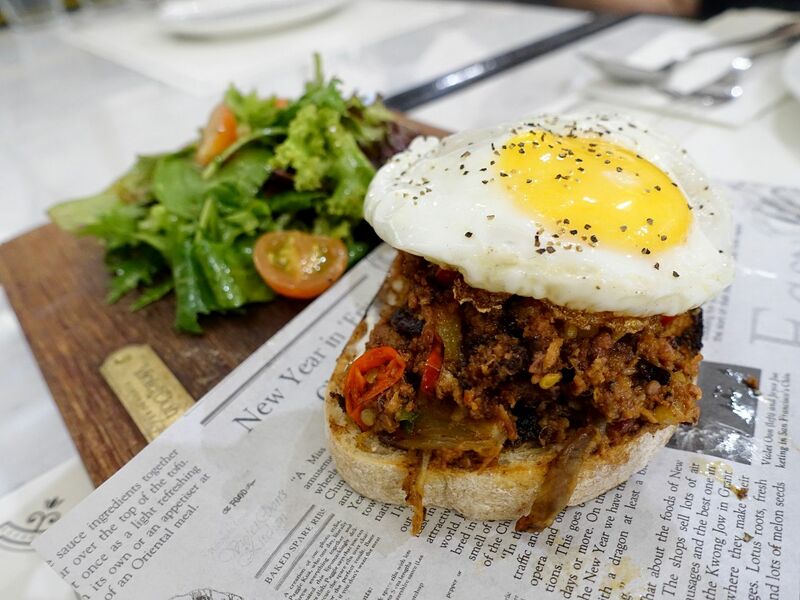 Over at Goodwood Park Hotel, their Coffee Lounge is presenting a 5-Course Singapore Commemoration Local Degustation Menu ($40/pax) until 30 Apr 2019. 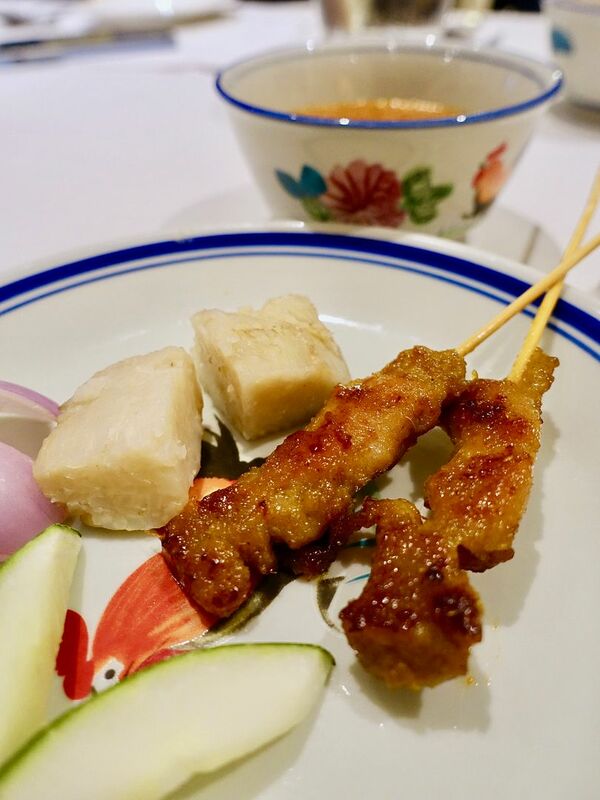 The local dishes on the menu are prepared with traditional recipes, To start, bite into the juicy Chicken Satay with Peanut Sauce, skewers of grilled chicken that were brought over as kebabs by the Arab traders, and later adapted to the Asian palate. 2 satays were certainly insufficient for the amount of peanut sauce though. The sauce could be a bit spicier too. 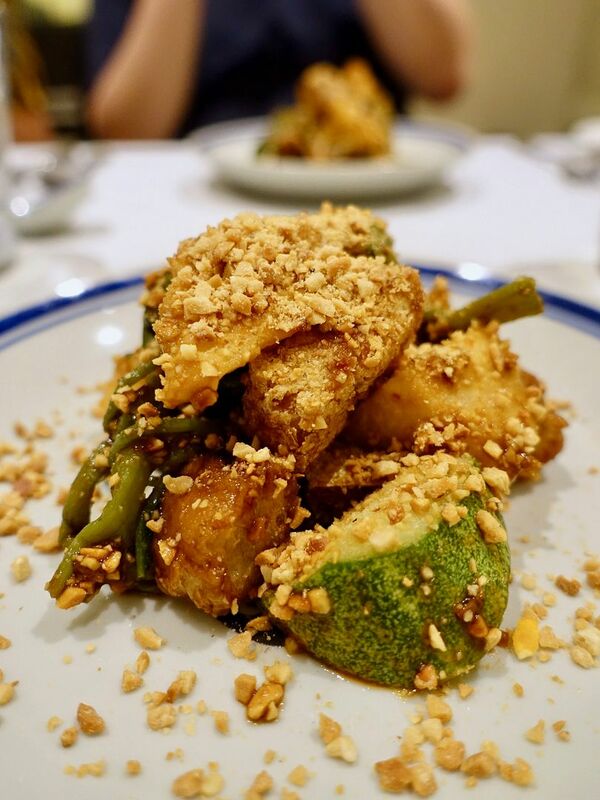 Singapore Rojak, or what i call an Singapore salad, consists of turnip, pineapple, cucumber, Tau Pok, fried you tiao, Kang Kong, bean sprouts and ground peanut, dressed with a tangy sweet black prawn paste. More fried you tiao (dough fritters) would be preferred. 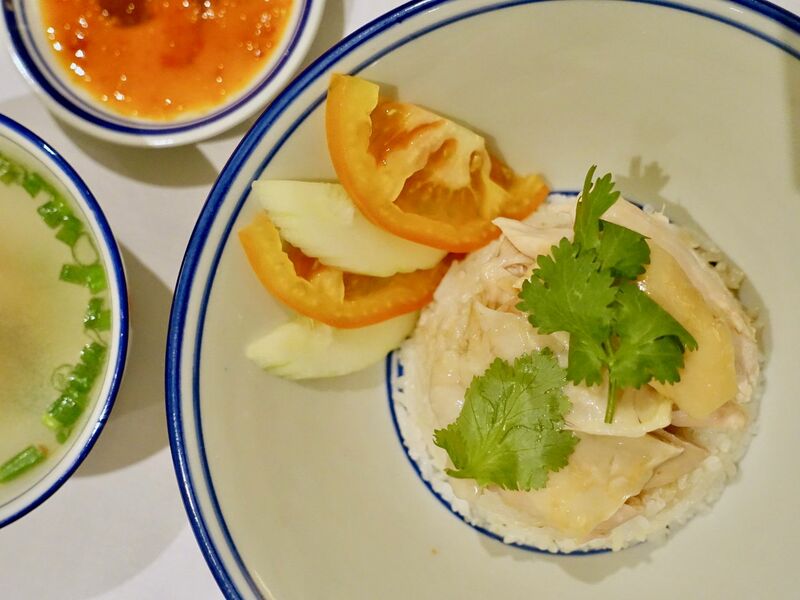 Pace yourself for the two full-sized mains, a Hainanese Chicken Rice, and Laksa. 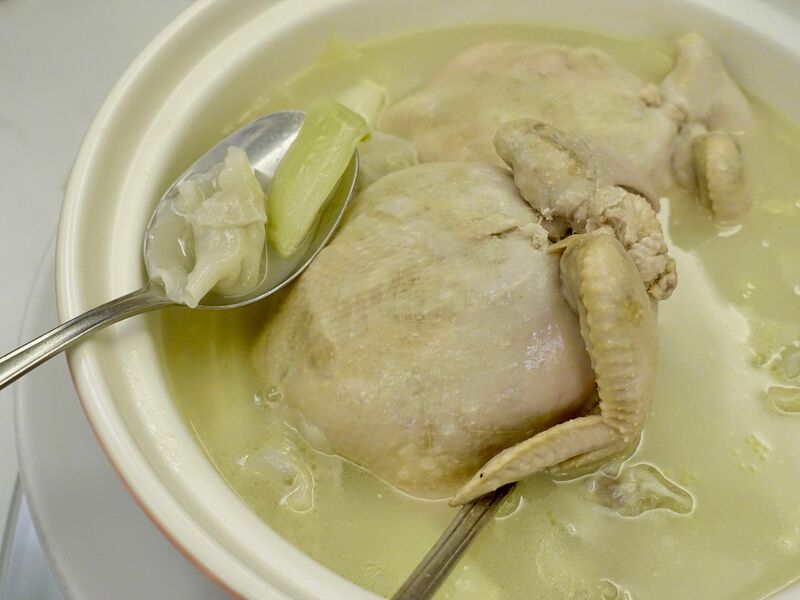 The smooth chicken is the result of poaching in chicken stock for an hour, and steeping in ice water to stop the cooking process for that firm succulent meat. I also enjoyed the bowl of fluffy rice that is lightly flavored but fragrant. Of course, chili is a huge part of this dish and Coffee Lounge's housemade garlic chilli sauce is made with big chilli (sometimes chilli padi to achieve desired spiciness), garlic paste, white vinegar, lime juice and sugar. 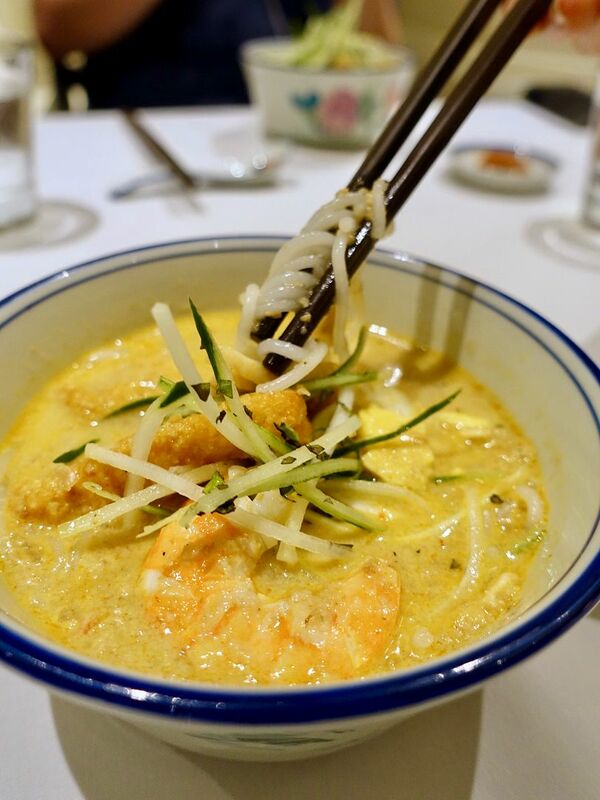 As for the Laksa, which has Peranakan roots, Coffee Lounge’s Laksa Singapura is full of prawns, fish cake, shredded chicken, fried beancurd and hard-boiled egg, swimming in a smooth coconut prawn gravy. The slippery rice noodles are cut into shorter lengths to be eaten the traditional way with a spoon. 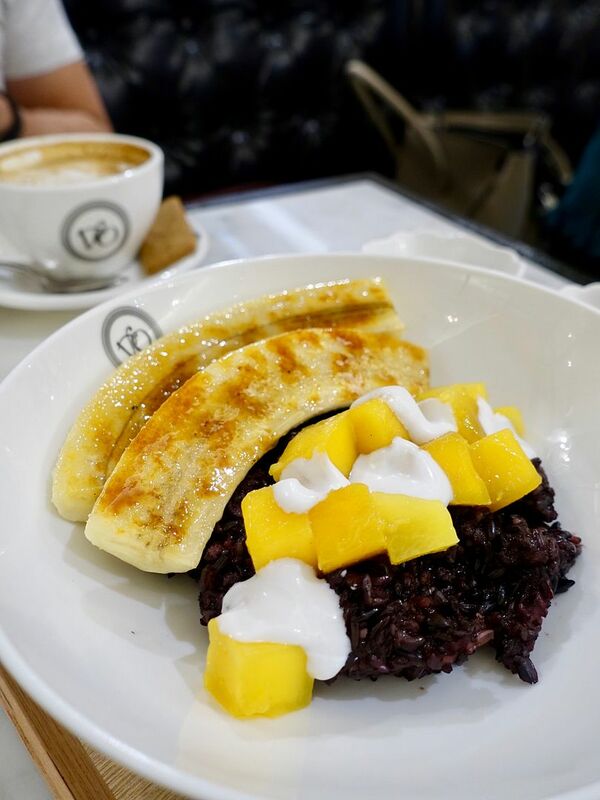 As though there wasn't enough carbs, dessert is Bubur Pulut Hitam, a black glutinous rice porridge enriched with coconut milk. Honestly i couldn't get through this even though it's pretty decent. Honestly i've not had a horrible Pulut Hitam before. A better dessert option would be Goodwood Park Hotel's signature, the Durian Mousse Cake. For the bicentennial, a special D24 Singapore Commemoration Cake ($88nett) will be available on 15 March 2019 in conjunction with the Hotel’s annual Durian Fiesta. 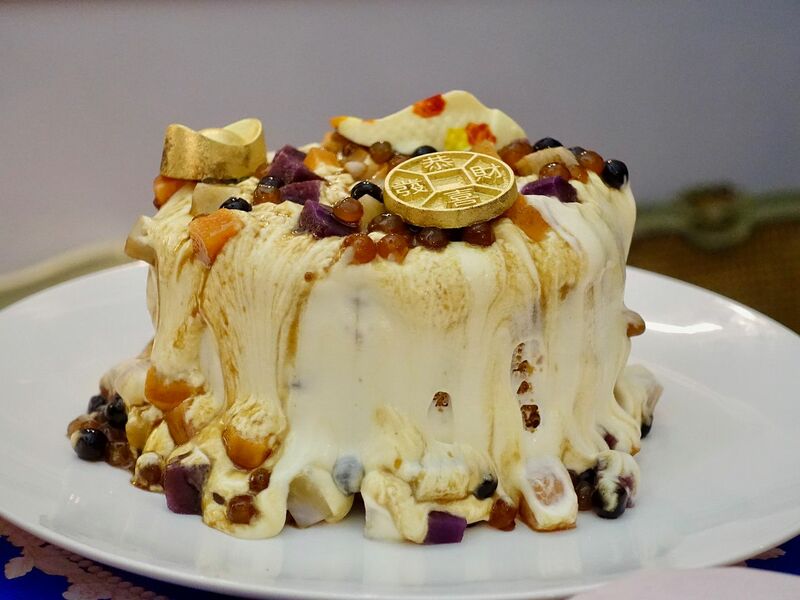 Featuring four flavours – gula melaka, coffee, pandan and durian mousse, the 1-kilogram cake is adorned with a mosaic of white chocolate squares imprinted with eight historical scenes of Singapore and Goodwood Park Hotel’s illustrious past. These cakes are limited to only 200 and orders need to be made 5 days in advance. What would you like to see, experience, or eat this Singapore Bicentennial? TLDR version of 2019 Chinese New Year reunion meals reviews. Decided it's quite impossible to feature each at length (i tried and died) so here's a summary of what i tried and liked at each of the restaurants. Will update this as there are more lo heis to come! Our first feature is Yàn, and Chef Lai Chi Sum has curated a selection of auspicious set menus and hearty Pen Cai to celebrate the Year of the Pig. With six set menus, ranging from $128 to $278 per person, and a bounteous Pen Cai, there is something for everyone. 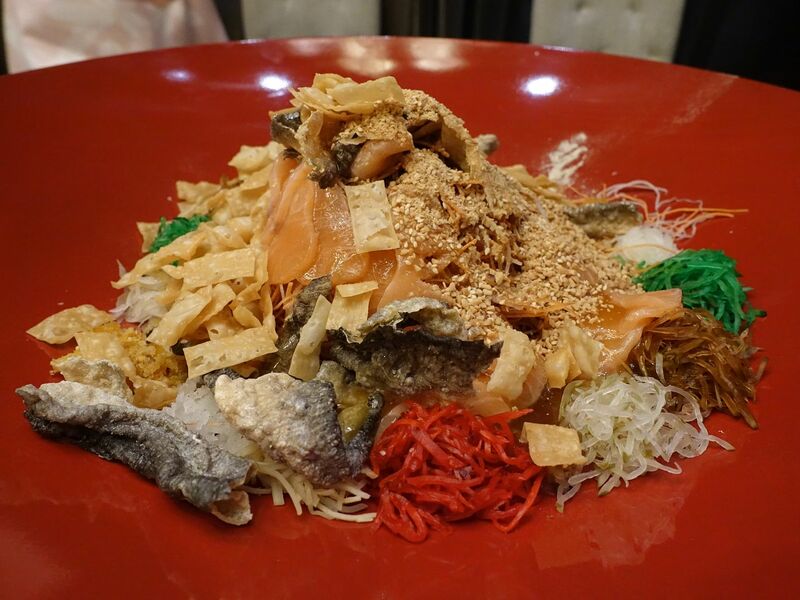 Yu Sheng ($138) at Yàn is of the Shun De style and features a mountain of crispy fried vermicelli is topped with gold leaves, and a medley of vegetables, sesame seeds, crispy youtiao, as well as slices of fresh salmon or yellow tail. This year, the special addition is bak kwa (bbq pork jerky). 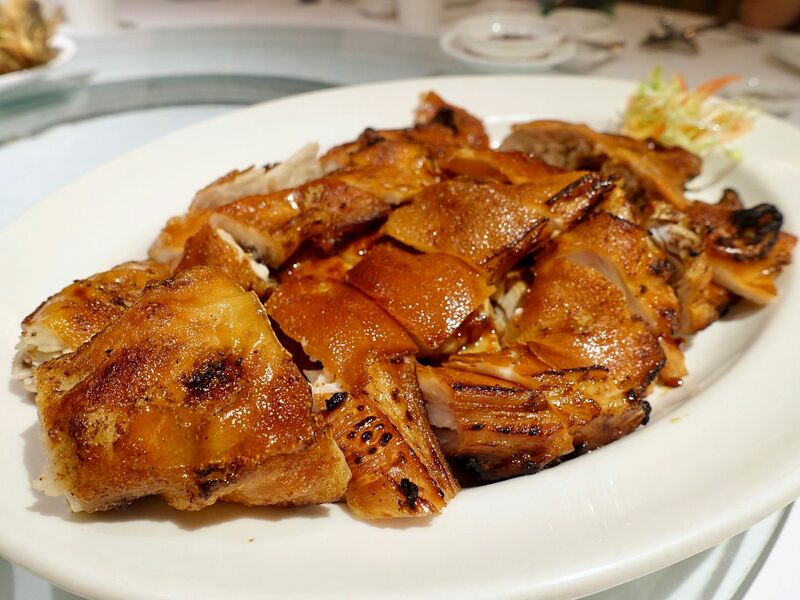 The Signature Roast Crispy Suckling Pig ($288/whole pig) has been and will always be one of my must-order at Yàn. Eaten three ways- firstly the crispy skin on a thin steamed bun with hoisin sauce, spring onions and cucumber; secondly the carved shoulder meat; and lastly the oven-baked fillet with lemongrass. 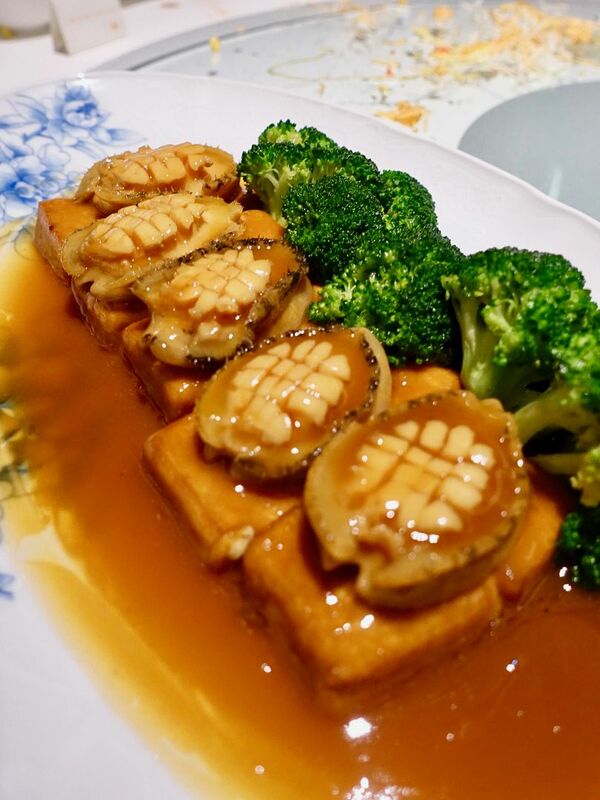 Braised ‘Mee Pok’ with Fresh Mushroom and XO Sauce. We had the latter and it was absolutely heavenly. The thin noodles were crunchy and smooth at the same time. Jade at The Fullerton Hotel Singapore has the ultimate decadent Lunar New Year feast From 21st January to 19th February 2019, Jade’s Executive Chef Leong Chee Yeng has curated an eight-course Grand Fullerton Golden Feast, 富丽豪华金猪宴. 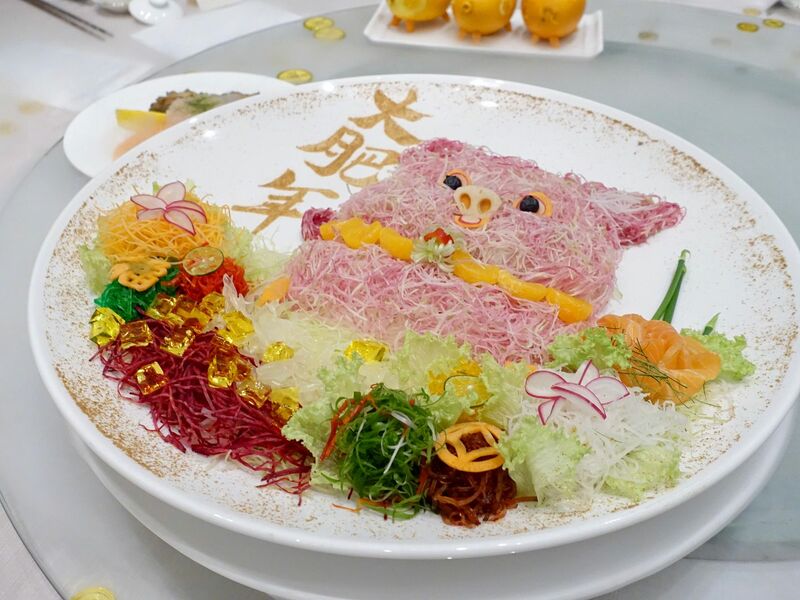 If you're looking to impress, the Golden Feast is priced at a whopping $2388 (for 10pax) and features ingredients such as lobster, suckling piglet, caviar and bird’s nest, alongside traditional Chinese New Year staples. 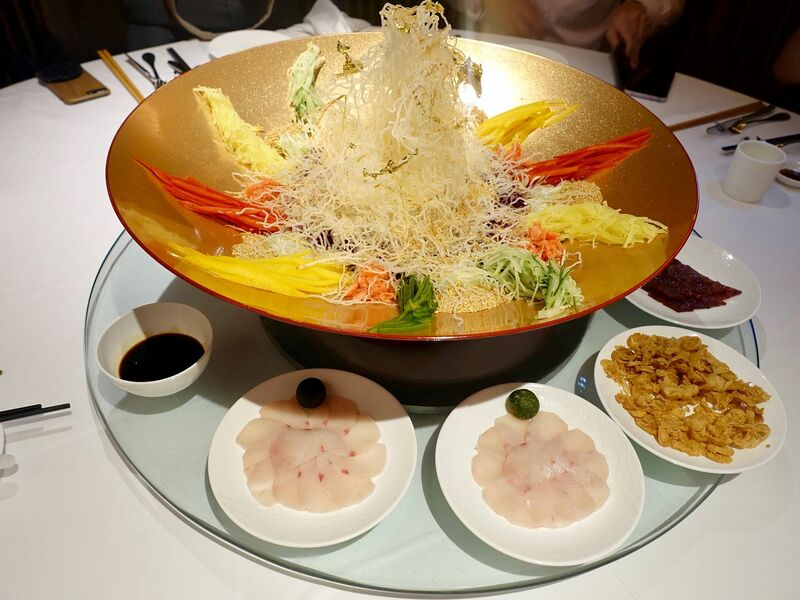 The star of the show is the Gold Rush Yu Sheng featuring lobster, Australian abalone and Norwegian salmon and champagne jelly with gold flakes. 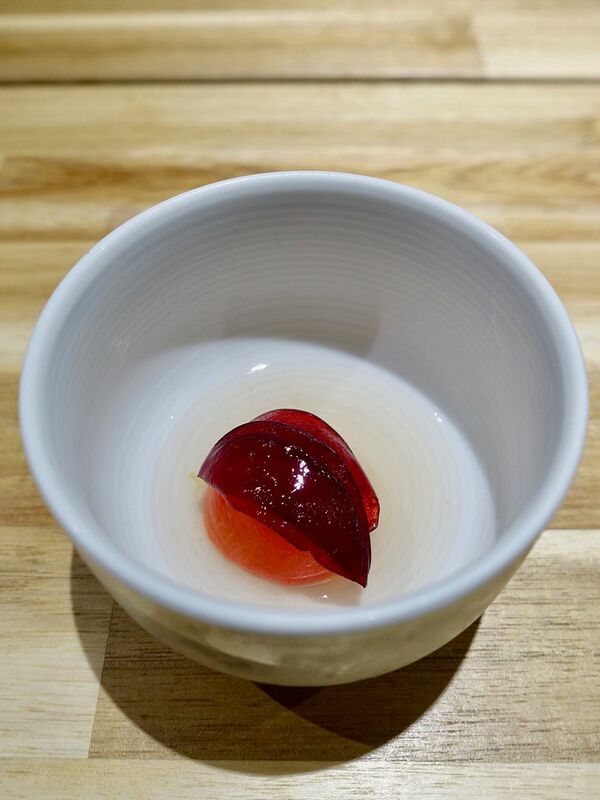 The jelly maybe seem a little OTT but it actually provides a cool texture to the dish. Of the delicacies, i thought the abalone contributed to the overall texture and flavor of the tossed salad. Overall, it's quite a balanced yusheng with notes of citrus from the honey pineapple dressing, which wasn't too cloying. 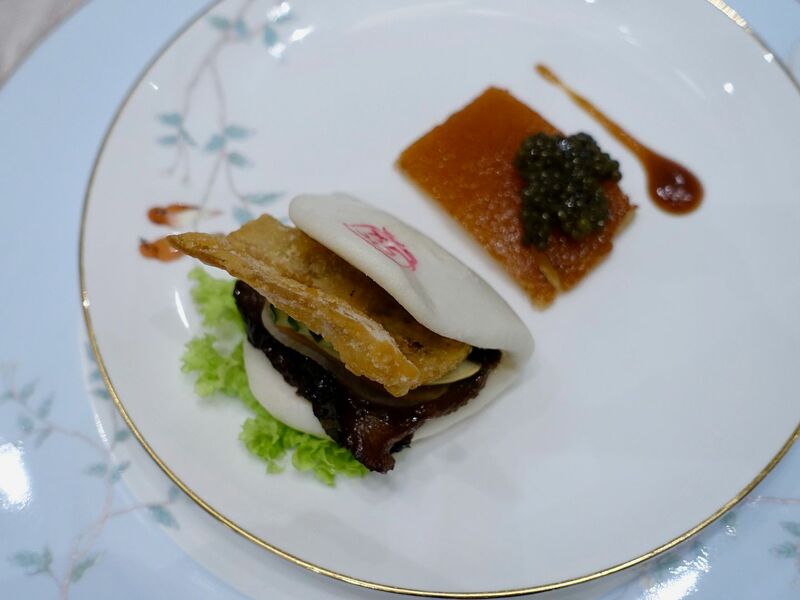 A nod to the Year of the prosperous Pig is the Triple Bliss Braised and Roasted Pork Belly with Steamed Mantou Bun and Crispy Suckling Piglet Skin topped with a generous dollop of caviar. Jade has found the golden ratio for the bun- the thin slice of braised pork belly packed so much flavor in it and the pickled vegetables was a lovely contrast to the rich sauce. The piglet skin was also super crispy but it was not hard, nor oily. 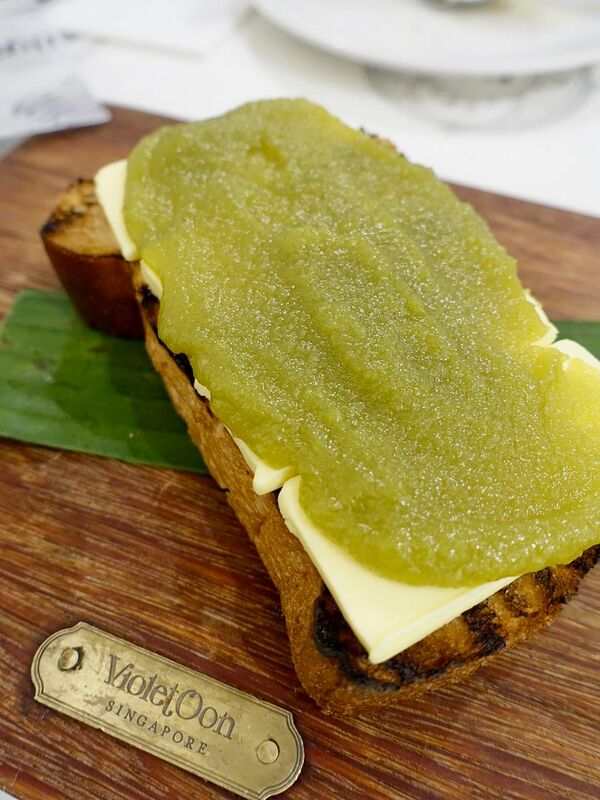 As decadent as it may sound, the caviar worked perfectly with the thin crisp with a layer of gelatin under it. My favorite was the fragrant Wok-fried Glutinous Rice with Chinese Sausages. 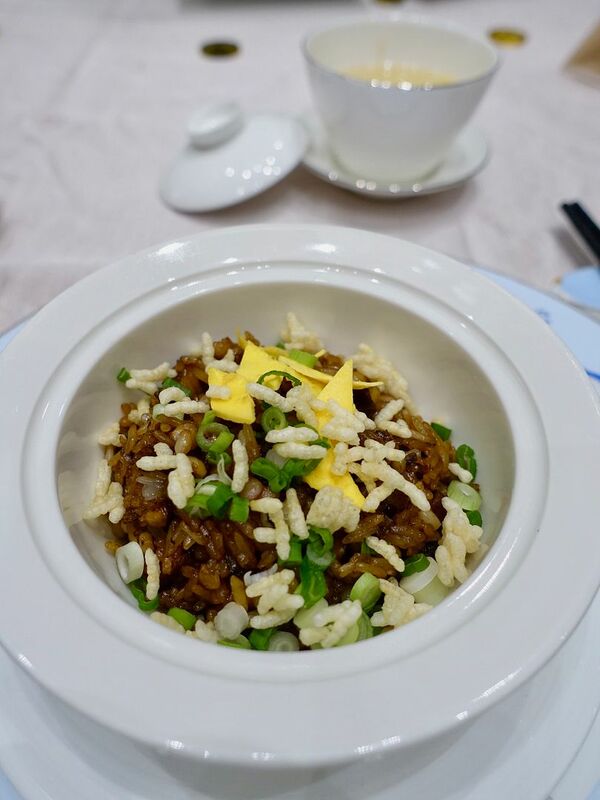 The five-grain rice is well flavored as it had been cooked with stock repeatedly and fried for that smoky wok-hei. My favorite part is definitely the lup cheong because it provides a light sweetness to each bite. Oh and the crispy puffed rice helps to make the dish less heavy somehow and i finished every grain in my bowl. 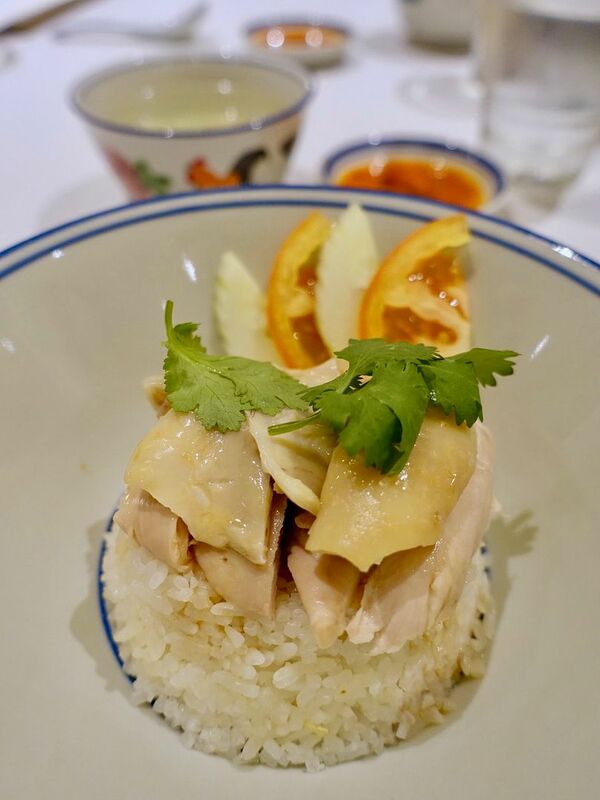 For a slightly different reunion meal that is star studded, Shisen Hanten at Mandarin Orchard is the highest Michelin-rated Chinese restaurant in Singapore featuring Sichuan-Japanese fare. 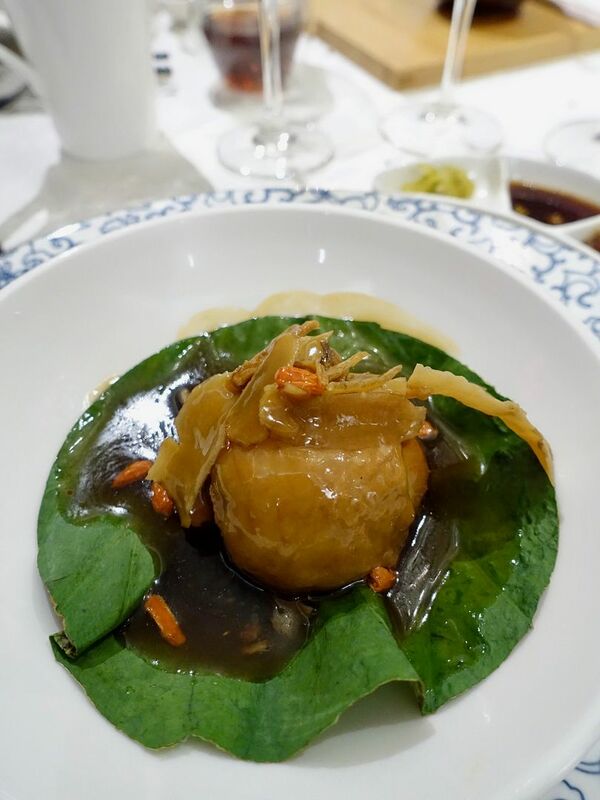 This year, there are seven auspiciously-themed set menus— from the eight-course Prosperity menu at $538 for four persons, to the Splendour menu that features Braised Four-head Australian Abalone among its courses, at $2,588 for 10 persons. *One of my favorite lohei for 2019* is the oldie but goodie Salmon and Fried Fish Skin Yusheng with a traditional sweet plum sauce here. Shisen Hanten's signature Foie Gras Chawanmushi with Crab Roe Soup is a must here and will be available on their a la carte menu and also on their CNY menu. 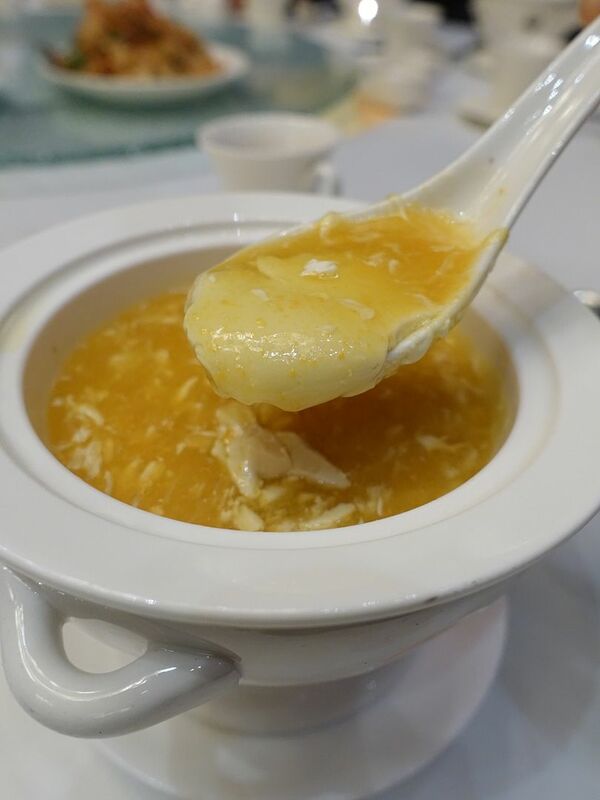 The foie gras is blended into the egg pudding and we enjoyed the silky sweet pudding with chunks of crab and roe. I could really use a Sichuan-Japanese Wok-fried East Spotted Grouper with Shishito Pepper. It smelled like spicy sichuan fish except that it's not. We could taste the Sichuan flavors in this (the tingling numbness of the peppercorns and pickled chili) but the soup was sweet and fresh. 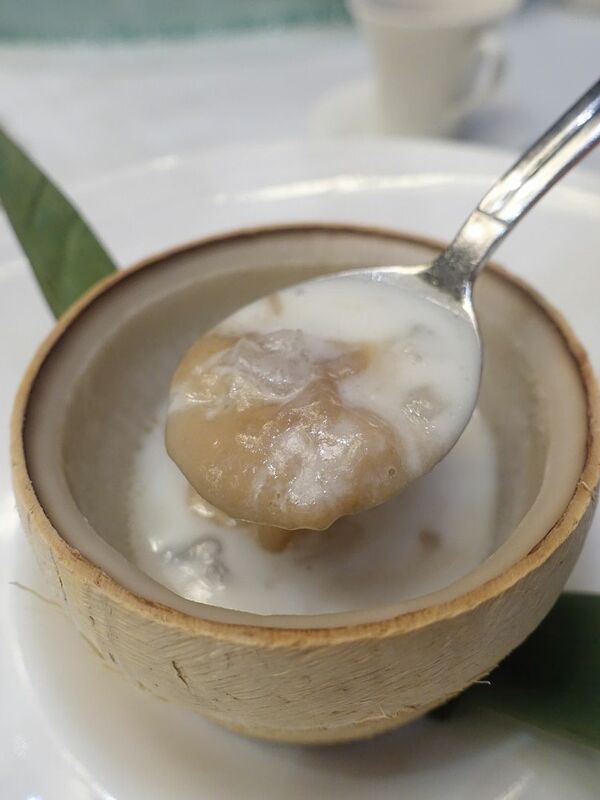 Our favorite dish was the Double-boiled Hashima with Yam Paste served in Young Coconut. Hot coconut is damn shiok. Super tender and when warmed, you can smell and taste the fragrance more. Wished there was more of the silky yam paste! 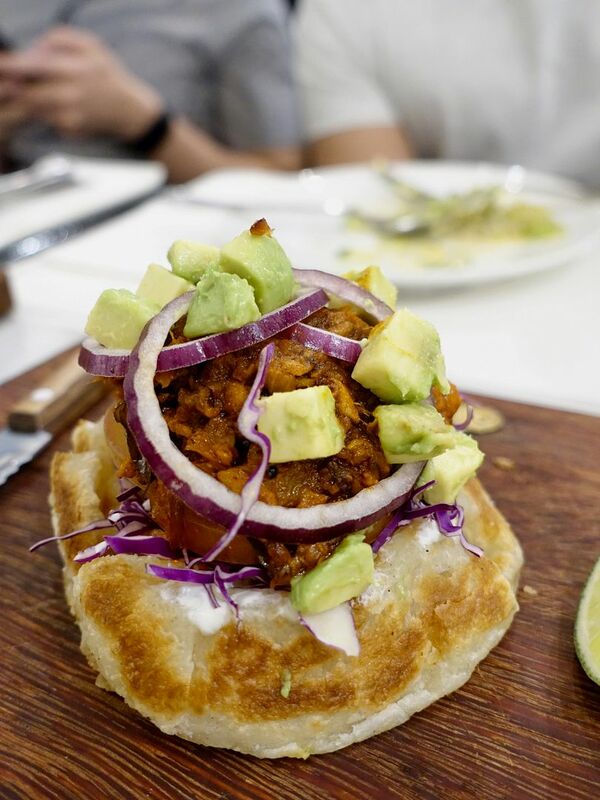 From Min Jiang, dine in their lovely restaurants at Goodwood Park and One-North, or take home their dishes and have it in the comfort of your home. 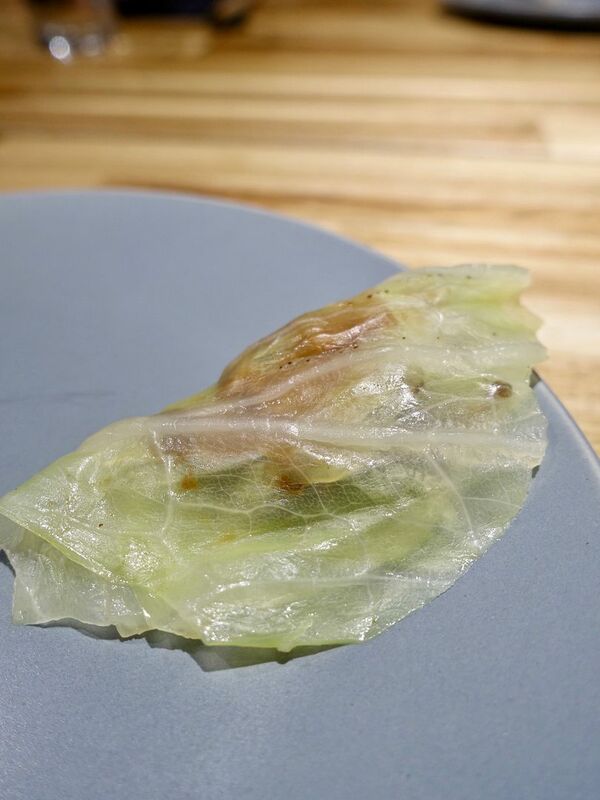 At One-North, do take home their Double-boiled Whole Chicken Stuffed with Bird’s Nest and Duck Foie Gras Dumplings ($308.15 nett, good for 6 pax). Each portion only consists of 1 chicken but you can not go wrong with a double portion of the chicken and the soup! I'm thankful for all the chicken which died for the super rich and creamy superior stock. I also highly recommend the Braised Pork Belly with Pan-fried Lotus Root Pork Patties and Sea Treasures in Claypot ($298++ dine in/$318.85 nett for six persons, includes claypot). The pork belly has been braised and steamed and it’s so tender and well flavored. I also really love the pork patties with crunchy strips of lotus root in them. 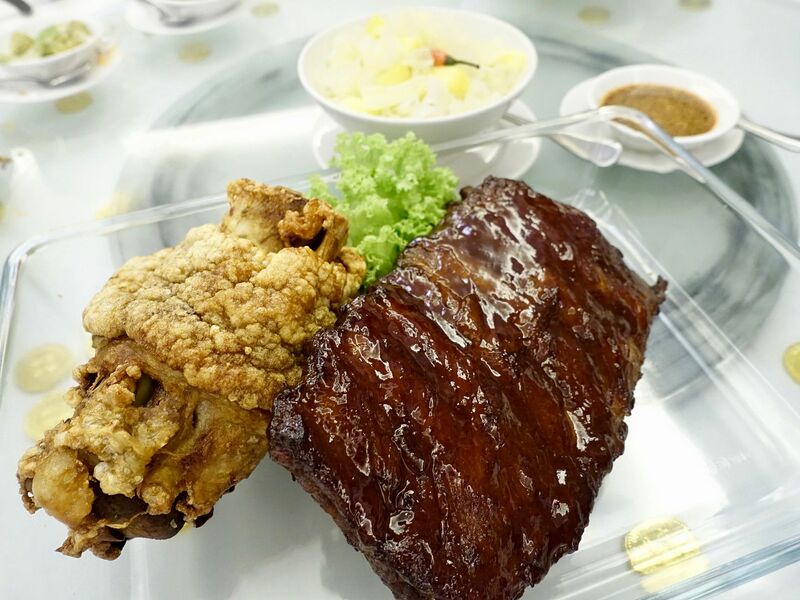 From Min Jiang Goodwood Park, you could takeaway their Prosperity Duo of Deep-fried Pork Knuckle and Slow-baked Honey Butter Pork Ribs ($147.65 nett, good for 6 pax). I was amazed at how the crispy pork knuckle was still juicy! The Aussie pork knuckle is first brined, then steam-based, roasted, and finally deep-fried. The flavors were amazing and i really enjoyed the mixture of pickled pineapple and cabbage that came with it. Of course, you cannot miss the durian desserts at Goodwood Park Hotel and their Trio of ‘Nian Gao’ ($32/42/52++) has just that- Chilled durian ‘nian gao’ roll, Deep-fried cempedak ‘nian gao', Pan-fried yam and pumpkin ‘nian gao’. My favorite was the nian gao roll made of gula melaka and glutinous rice and rice flour, and rolled with a mix of D24 durian puree and kaya, then coated in desiccated coconut. Sadly, you can only have this at the restaurant. Another place that i'll be ordering from this CNY is Chef Pang (of Antoinette) Pang’s Hakka Delicacies 小彭客家菜, his brand-new concept which serves delicious, authentic Hakka cuisine for take-out only. I cannot stop thinking of his Hakka Abacus Seeds 客家算盘子 ($8/250g, $30/1kg), which is made from premium yam from Thailand and individually shaped by hand. 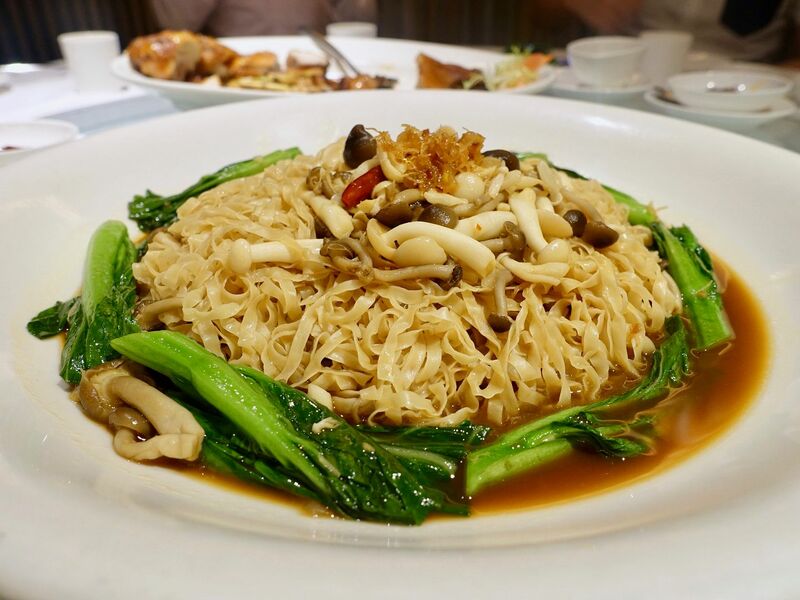 They are then boiled and sauteed with other ingredients such as premium dried shrimps, dried cuttlefish, leek, garlic, black fungus, dried mushroom, Chinese celery and fresh minced pork that are sourced daily. 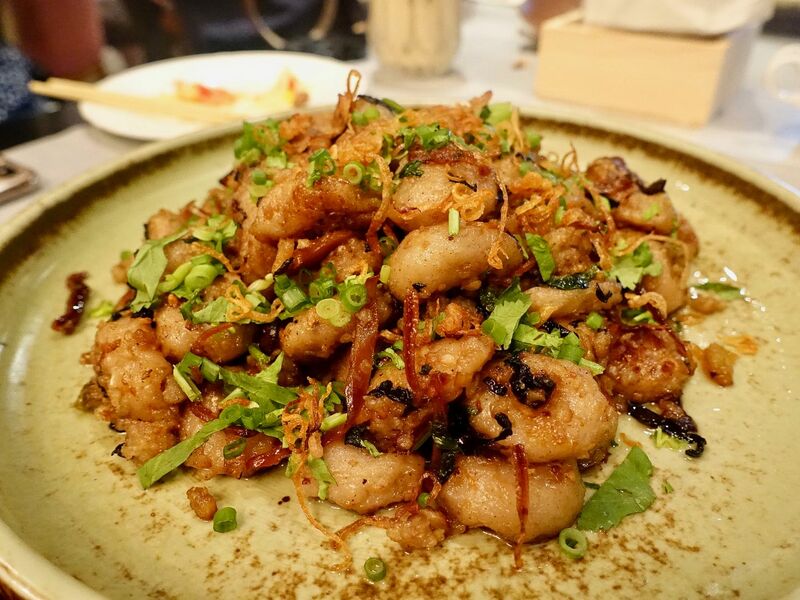 The yam gnocchis are then garnished with home-fried shallots, fresh spring onion and coriander. T$8 (approx. 250g), and $30 (approx. 1kg). 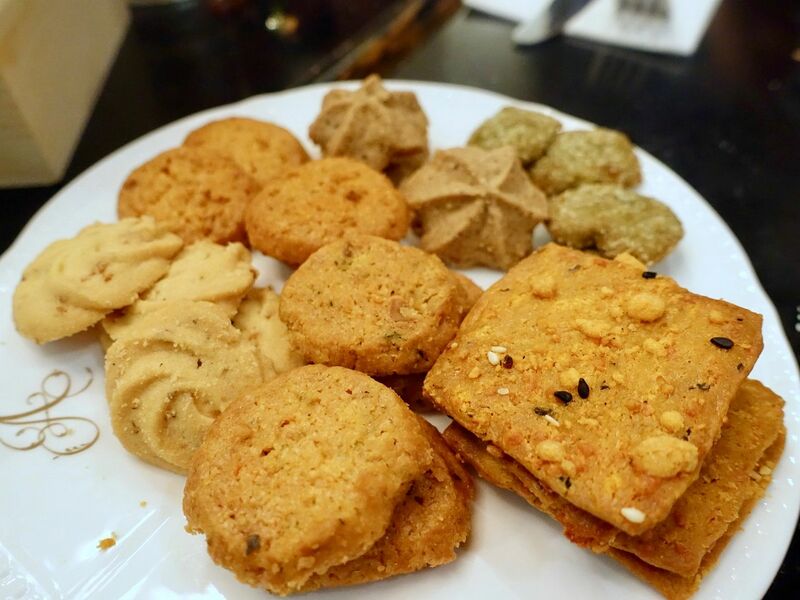 Other items on offer include a Hakka Mee Tai Mak, mugwort kuehs, leek kuehs, and also yam cake. There's a 10% surcharge for CNY and they are available everyday of CNY except for the first 2 days. Place your order via WhatsApp and pick them up at Antoinette. 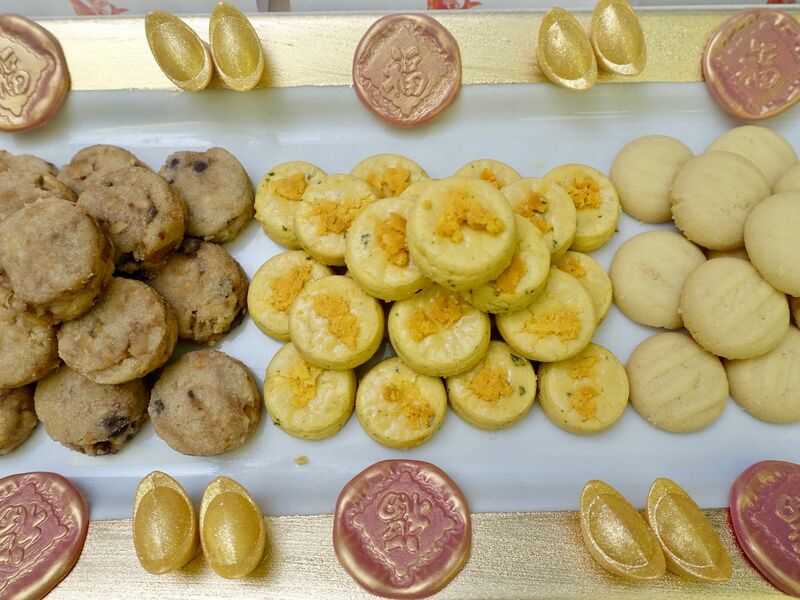 Of course, a variety of bakes and sweets are available also at Chef Pang's Antoinette. 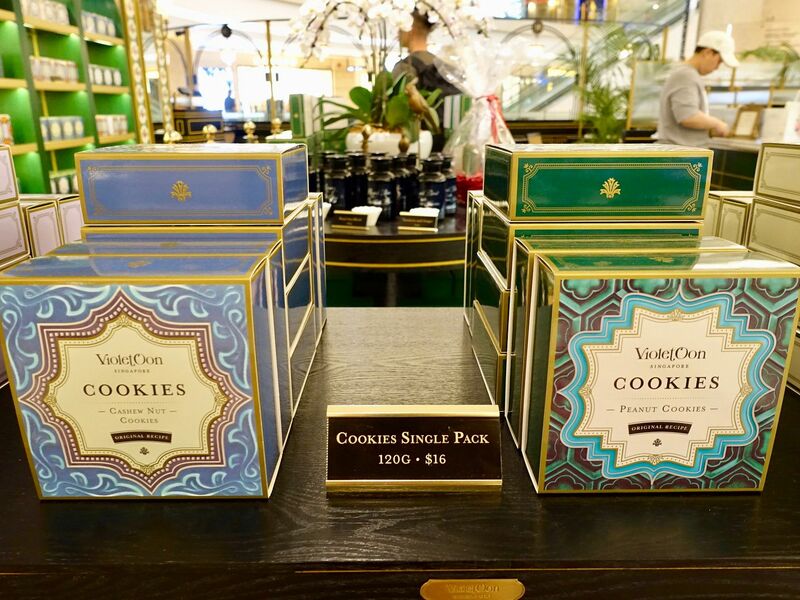 His variety of cookies were really tasty. My favorites by order- Ondeh ondeh, curry cheese, hae bee hiam (it packs a punch), and kopi susu. 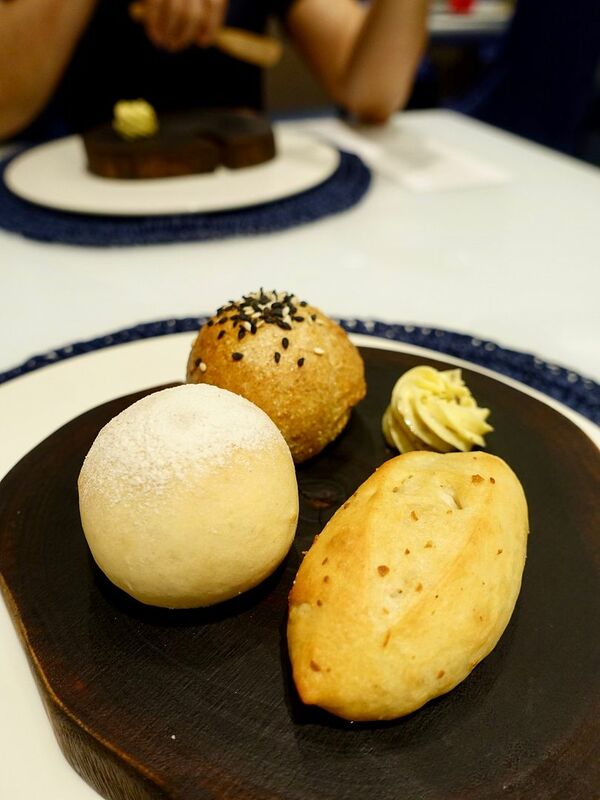 Other special bakes include a Hong Bao ($10/25), a red dragonfruit soft bun filled with 年糕 mochi - made with black sugar and fried shallots, pork floss, lightly candied yam and sweet potato, and cubed salted egg. I liked how the pork floss breaks the sweetness of the other ingredients. The large bun requires a 3 day pre-order if you're interested. My preference for sweets is Antoinette's Abundantly Cake ($38) aka 财源滚滚 cake is a favorite of mine. I'd say it's like a bubble tea cake, with the salty cream cheese and black and golden tapioca bubbles on it. Ignore all that decoration and you get a really delicious and light purple sweet potato chiffon cake with a salty cream cheese frosting. It's certainly not as sweet as bubble tea! I've never ever been disappointed by Man Fu Yuan's dishes and i don't think i'll ever be. Their yu sheng is one of the better ones- we had the Prosperity Yu Sheng ($138, good for 10pax) with Hokkaido scallops, salmon, crispy pork skin, with a refreshing apple sauce. Another of my must-orders include the Man Fu Yuan Abundance Treasure Pot ($398, good for 5pax), which is packed with fresh seafood, trotters, and cured sausages! 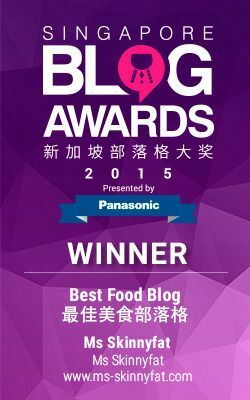 Their highlight this year has got to be the Roasted Pork Belly Roulade with Minced Seafood ($368/4kg). The skin was amazingly crip and i absolutely adored the fresh and succulent minced prawn paste which has the lovely sesame oil fragrance. 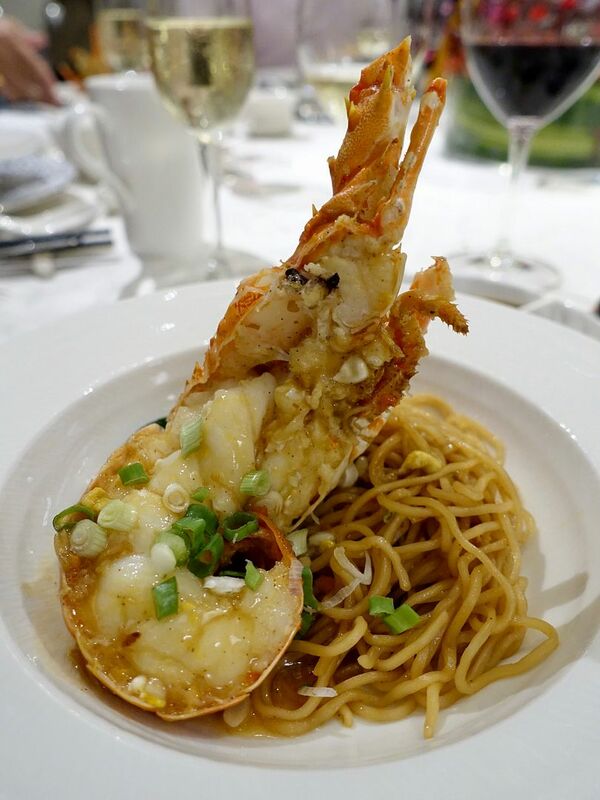 If you're going for one of the reunion set menus, keep a lookout for the X.O Chilli Sauce Lobster Egg Noodles and Herbal Chicken in Lotus Leaf, which were among my favorites. 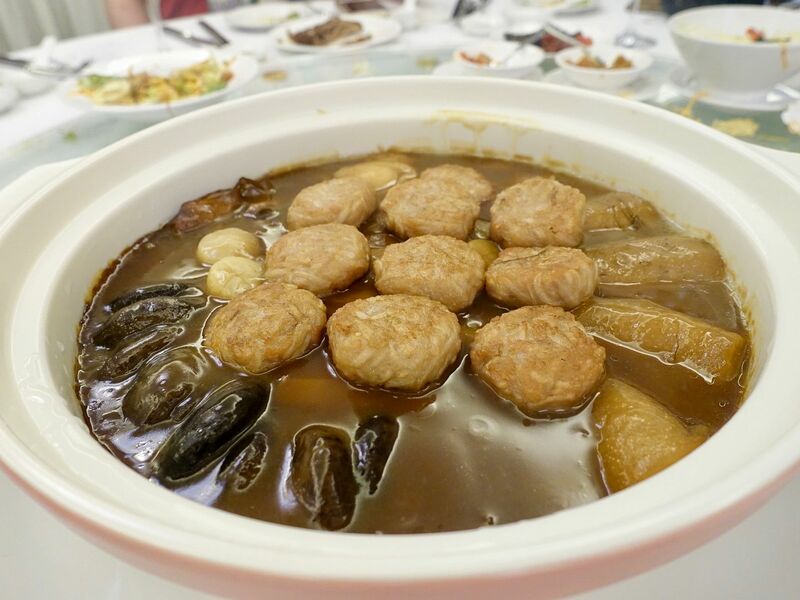 Among the above items available for takeaway, you may also want to consider ordering Man Fu Yuan's Steamed Yam Cake with Roasted Duck Meat ($48/1kg) which has a lovely smokiness to it. A less traditional setting for CNY dining is the super cool Madame Fan at JW Marriott. For the New year, festive menus are priced from $78/pax. Madame Fan's Prosperity Yu Sheng ($88/128) is my top favorite yusheng this year due to its savory yuzu soy dressing. 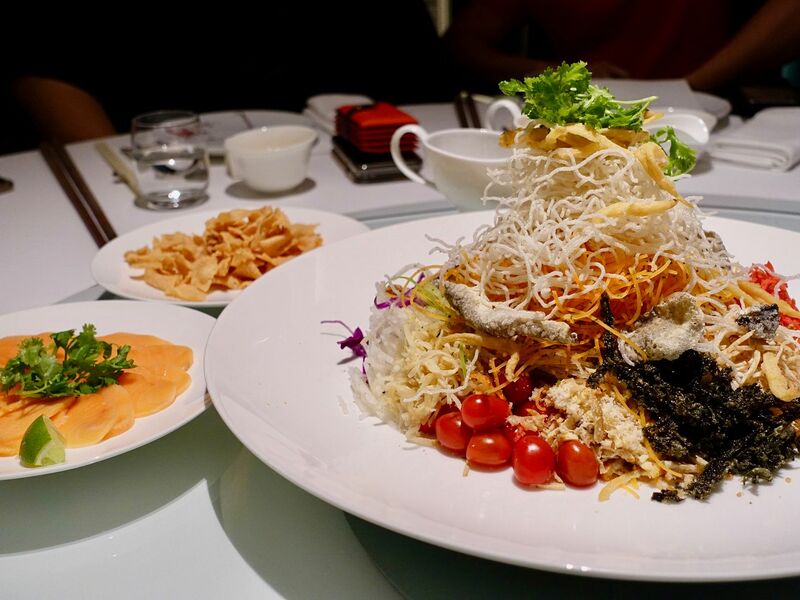 Crispy rice noodles and silverfish, crunchy purple cabbage, acidic green mango are among the items to provide that crunch in each bite. 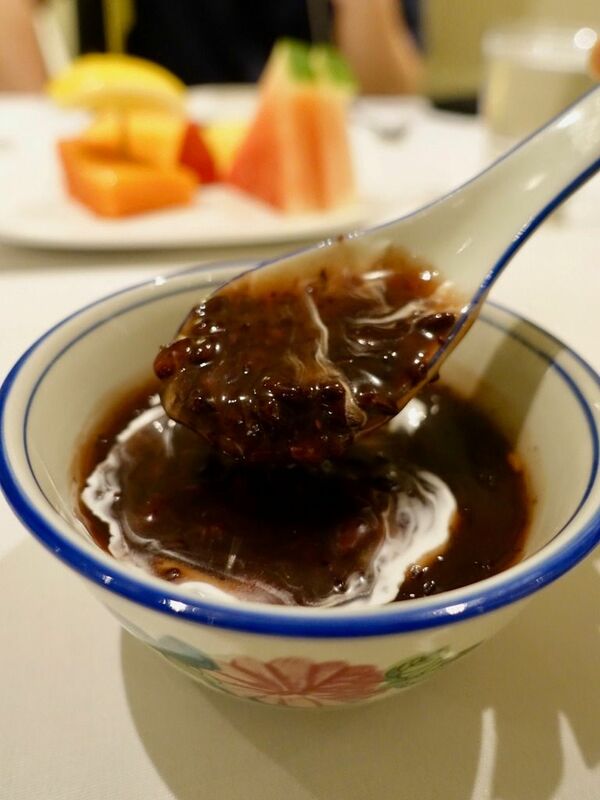 Other recommendations include the signature Double Boiled Four Treasure Soup, Silky tofu topped with springy South African abalone in a superior broth gravy, and also the Charcoal-grilled Wagyu with Foie Gras coated with pepper sauce that is soooo buttery (and a bit oily la).